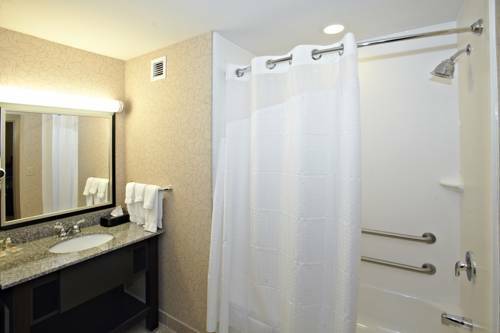 Welcome to Holiday Inn Hoover, Birmingham/Hoover's newest full service, Quality Excellence hotel Conveniently located near I-59, I-20 and I-459, it provides quick and easy access to all the area has to offer. Our business guests will be pleased to find complimentary Wi-Fi throughout the hotel, and daily dinner specials in our restaurant. Individually designed meeting and banquet space is available to meet your every need. Our hotel was built by business people for business people. Experience all that the area has to offer by visiting the Galleria Mall, the largest mall in the southeast, located right down the street from the hotel. An entire afternoon can be spent in historic downtown Birmingham, wandering through Linn Park, enjoying the Birmingham Civil Rights Institute and a tour of the Birmingham Museum of Arts. After a day spent enjoying our city's wonderful sights, return to the Holiday Inn by the Lake and park for free, be greeted by professional, friendly staff, enjoy time in front of the lobby fireplace and dine with us in our full service restaurant, bar and lounge. Some rooms will include the picturesque view of the lake, complete with wildlife that provides great scenes unexpected in an urban environment, so close to everything you want to see and do. Your comfort and enjoyment is our primary concern, and we have created the ultimate in affordable luxury for business and pleasure. Firebirds: Serves Steak, Seafood, and Cocktails in an upscale lodgelike setting. SaltGrass Steak House: Serves Steak, Seafood, and Cocktails in an upscale lodgelike setting. Kems Restaurant: Kems Restaurant and Lounge offers a casual dining experience with great food and signature drinks. Jefferson Room: 2100 square feet located on main floor of hotel. Jefferson II Ballroom: 1275 Square foot meeting room perfect for your corporate meeting or after rehearsal dinner. Jefferson I Ballroom: 810 Square feet of meeting space located on the main level of the hotel. Galleria MallWith over 150 retail stores and restaurants, this area is your shopping meca.